In yesterday's post I made reference to some siege game rules which appear in Appendix 3 of Christopher Duffy's wonderful Fire & Stone - The Science of Fortress Warfare 1660-1860 (Peters, Fraser & Dunlop - London, 1975). 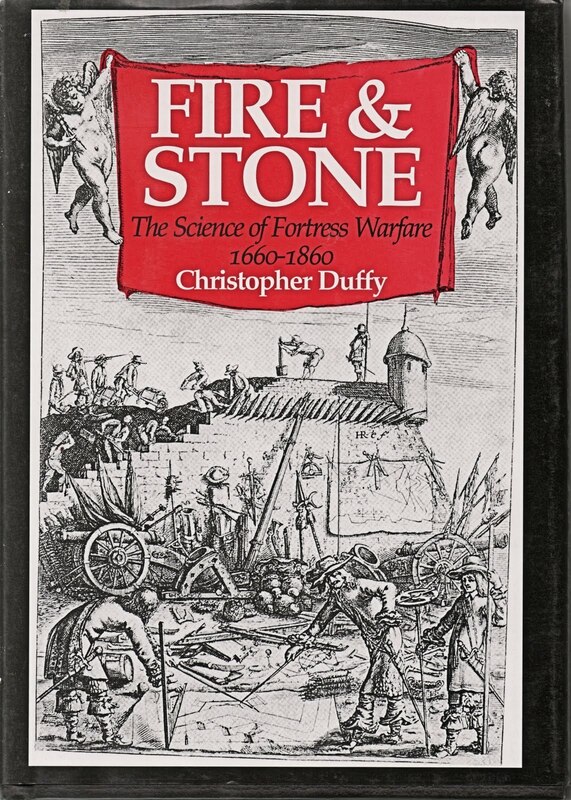 I've been re-reading this book recently, along with its "prequel" for the period 1494-1660, which was published some 4 years later. At the beginning of this same Appendix 3 there is a paragraph which made me chuckle. Nowadays the views expressed would not be regarded as reactionary or even particularly controversial, but the loss of direction within the wargaming hobby which is described here has a lot to answer for - for me, certainly. In this paragraph is the very thing which forced me into a 10 year sabbatical, which explains my periodic ebb and flow of enthusiasm - maybe even why I have mostly done my wargaming on my own, away from fashions and from know-alls. I wish I'd read and understood this around the time it was published - I shall certainly keep it handy as a reminder now. All those games which would not and could not ever end - how much would you like the time back now? The original, recreational spirit of wargaming is preserved among civilian and military enthusiasts who have devised rules which enable them to re-fight battles and campaigns of any period in the past. Unfortunately the codes of regulations even in the amateur game have become so elaborate that the participants spend more time in making their calculations and arguing among themselves than in moving their pieces. Thus a re-fought Waterloo or Gettysburg often proves to be hardly less acrimonious than the original version, and the sense of the rapid passage of time - one of the most vital elements of "realism" - is frequently lost altogether. I wonder if Mr. Duffy today still adheres to his 1975 observation on wargaming? While I have participated in games where an "Argue the Rule" Phase was de rigueur, those games are long, long in my past. My perception is that, on balance, rules evolution over the last forty years has resolved many of these "Friday Night At the Fights" during a game. Perhaps the rules' trend of less complexity and faster play reduces this tendency? If not, then find a more congenial group of guys to game with or do as you suggest; game solo. Mr Duffy is 80 now, and I believe he is still active, though I am told his health has been uncertain. The myth of the "more congenial group of guys" is an oldie but a goodie - it used to be a commonplace rejoinder to complaints about crap rules - "I say sir, your rules don't really explain what happens in a melee very well - my group can't agree what is meant by .... etc etc" - Answer: "Get yourself a more agreeable group!" - hmmm. A lot of the early rulesets which were popular were established in a situation where someone called the shots, so all the holes in the logic could be decided by a supremo. In the military it would be an umpire - in 1960s/70s British wargaming, very few would stand up to Featherstone or Gilder or Jeffrey or etc etc in a straight shouting match, so the guys with the biggest personality assumed a sort of umpire/rule clarifier position along with their playing role (which means, i would guess, that they seldom lost). One of the early attractions (to me, like) of boardgames was that the rules hung together and did not require this central bully role to make them work. I spent years trying to get miniatures to work with the same clarity. The move toward simpler rules has certainly been a welcome help. The tactical level bit of Duffy's siege game looks a lot like Charge!, in fact. Eventually the mojority of them seem to have died off, though I'm not sure why - maybe the 'newer' style of rules and games. So, I support Herr Duffy's view and almost certainly would have then. As The Lardies say, play the game, not the rules. Hi Gary - Funny you should mention the Battleground vids on YouTube - I think it's brilliant that they are available to watch again, and I accept that they are held to be a kind of national treasure. I watched the Gettysburg programme again a few weeks ago, featuring Peter Gilder and Paddy Griffith - it always surprises me that Ewwa Wuwwa is a lot more polished than Callan ever was, by the way. I've discussed this with a few people before - it's lovely to see the wonderful terrain and all the figures, it's also great to see some of the noted personalities of the hobby in action. At this point i am going to offend someone, and i really don't mean to, but, as a spectacle, the opening moves of the Gettysburg game mainly serve to explain why the hobby was always of minority interest. It progresses at the speed of paint drying - Gilder explains the rules as they go along, which is fair enough, but it is all jolly leisurely - I start to feel that they are in for an uncomfortably long evening. OK - no problem, and the Gettysburg episode is pretty good in many ways, but I recall one of the other programmes features unrelenting, obviously unscripted banter between the players - it's occasionally slightly amusing, but the rest of the time it grates quite a bit. Let's be fair, the guys are on TV, so they are going to be a bit edgy, and will be camping it up a bit, but it gets awfully childish at times. Banter used to be a constant feature of my club visits in the early 1970s - the banter was the sort of jocular put-down of the opposition which you often come across on the golf course, but it's often designed to demonstrate how much of an expert the individual is, though statement of the bleeding obvious is a mainstay. The Inner Circle at the clubs used to do this a lot - even when it wasn't useful or relevant - "of course, we have to remember that Napoleon had a lot of captured Austrian guns around this time...". How true, but not useful. So - what is my problem? To be honest I'm not sure, but there is an old sore there somewhere - the Battleground programmes show a lot that is fun and enjoyable, but they also show some inexperienced broadcasters playing a very, very slow game, rambling on incessantly and trying relentlessly to be witty. I think Paddy Griffith comes across particularly well, probably because he is an experienced public speaker and has a better, more comfortable level of self-awareness. This is the final outrage - there are times during the Battleground when I am actually cringeing on everybody's behalf - the participants, because they are unfairly exposed, and myself, because I realise that i would have been embarrassed to be there. Interestingly both Lawford & Young (Sandhurst colleagues of Duffy I think or near misses anyway if the timing was off) and Featherstone all warn of the dangers of paying strict adherence to scale and detail vs the speed of the game and the effect a rule has on player's choices and how his troops' act on the whole rather than in detail. The opposite not only fosters said arguments but too often 2+2+2 of scale and detail too often end up making -2 instead of 6 when applied. What is so hard to understand that having started with such advice why did it taking me 20 yrs before I began to think they might have something and 20 more years of occasional relapses? Absolutely correct - the bit where the attempt at a scientific approach breaks down is that we don't really understand (or even recognise) the underlying factors. If we have an wildly approximate idea that Factor A should have an effect of a, and similarly for Factors B & C (giving rise, of course to effects of b & c), and if the observed, historical cumulative effect is d (which also includes influences by Factors E & F, which we forgot about entirely), then it is very likely that a + b + c is not at all equal to d, and it would save time and headaches if we just worked out d as a single result. The pseudo-science bit, as we have discussed before, I think, seems to stem from a need to be doing something more imposing than playing a game. I don't see this as a problem - world-class players of chess, bridge (and probably GO, I wouldn't know) all manage to retain all the rules in their heads without sheets of paper or wallcharts, and the prestige of the game is not compromised by this obvious crudity of design. I thought your comment about Duffy's rules looking a lot like Charge was very interesting. A couple years ago I had the privilege of playing an 18th C siege game put on by Ross MacFarland ("Game of the Month"), who expressly used Charge to handle any aspects not covered by the siege rules! And a great time, incidentally, was had by all, especially when I remarked to my teammate that we should suspend rolling dice in melees, as we were losing them all anyway and it would speed up the game. Ross started to laugh, but was taking a ground-level view of the board at the time, and accidentally breathed in some flocking; he spent the next 20 minutes coughing up a lung. War is hell. This is a great story - especially as Ross appears to have lived to fight again. The fact that we are (well, I am) looking for a presentable siege game and that we/I should simply have asked Ross is not lost on me. If he doesn't volunteer something in response to this then I shall feel obliged to stalk him until he does. Thanks Chris! Aftre 5 years I had managed to forget that bit! My main role was to do some preliminary design followed by some teleconferences. The boys down in Maryland did the rest of the prep. So I just had to show up and be entertained by the players who graced us during the weekend. But by all means if you think any particulars or issues might be useful to hear about, ask away. Ross - thanks for this - I can't believe I missed that post, and the one (or two) - I recall reading about your trip, but took my eye off the ball rather badly, so that I missed the siege games. I see that they were deliberately based on Duffy/Charge, as stated. (1) I am, of course, attempting to work a hex system into there, and thus am attempting to adopt something like C&C as the tactical level rules - yes, it requires a few cracks to be papered over. (3) There are a couple of bits I'm quite proud of, if I can get them to work properly - in particular (though I have to get the numbers to work better), there is a fiendishly cunning mining rule which involves time-travel (no less) and does away with the need for an umpire or secret written orders (which are not great for soloists). (4) I wanted to do more (in a very simplistic, practical way) on things like population/garrison morale, famine and plague, without turning it into the Perfect Captain. I'll read your 2011 posts again, and may hassle you briefly via email for a couple of further thoughts. Leaving aside plague, hunger etc and sticking with sapping, looking back on the occasinional need to inject some simple engineering into our Colonial/Battlecry games, things like demoliton of a bridge or building a pontoon one, I would probbaly think along these lines. To sap across a hex requires x number of points and the unit must be accompanied by an engineer. The unit rolls combat dice as normal effecting 1 pt of saps by rolling a given symbol. (haven't played enough C&C to remember the symbols used but a custom die with pick and shovel would be nice) . The unit may be fired at and takes hits as normal with the usual efects but crossed swords will take out the engineer halting all work until/he can be replaced. A successful sortie assault may remove a sap automatically if the hex is occupied. Thats as far as I got.